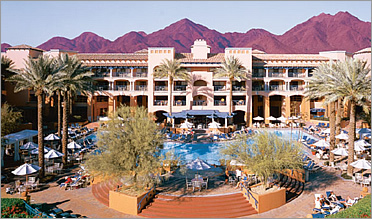 Located 35 minutes from the Phoenix Airport and 20 minutes from downtown Scottsdale, this full-facility resort sits on 450 acres of desert property framed by the McDowall Mountains. The Mexican colonial style, four-story hotel building housing 507 oversized guest rooms (each no less than 525 square feet), the 68 825 square-foot villas, 119 725- to 850-square-foot casitas, 16 1,275 square-foot master suites and two 2,700 square-foot presidential suites are surrounded by waterfalls, fountains, ponds, court yards, flowers, palms and gardens. The convention facilities are diverse and impressive as well. The resort boasts a full range of sport facilities including two large pools and a family-recreation area with water slides, private cabanas and shallow swimming areas for children; a tennis complex with seven courts, a pro shop and a 6,200-seat stadium, site of several classic tennis tournaments; two 18-hole tournament Player’ Club Golf courses designed by Moorish and Weiskopf; the 44,000-square-foot “Willow Stream Spa and Fitness Center”, one of the most imaginatively designed and exquisite facilities in the world; and throw-back fishing ,volley ball, badminton, croquet and putt-putt greens. There are a variety of excellent restaurants including an upscale Mexican restaurant and the romantic Marquesa featuring imaginative Mediterranean cuisine with Spanish, French and Italian influences. Strong Points: A truly full-facility, self-contained resort with a plethora of superb sport facilities and dining options ideal for couples, families, and business meetings.